Because they can identify potential stress points in the markets months or even years in advance, astro-traders have a unique advantage, no matter what trading vehicles they prefer to profit from. 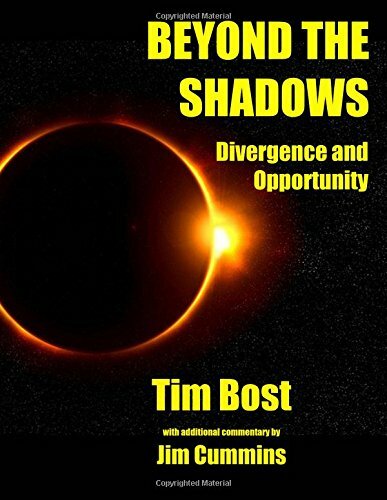 In Beyond The Shadows, Tim Bost, the editor of FinancialCyclesWeekly.com and the author of Mercury, Money and the Markets, presents cutting-edge analysis strategies and timing techniques. In revealing the enormous effects that geocosmic phenomena have on human affairs,both in and out of the markets, he focuses on the impact of a solar eclipse to demonstrate the ways that a knowledge of planetary cycles can open up remarkable opportunities which go far beyond the conventional limits of technical analysis and market fundamentals. These remarkable insights are not only useful for dynamically enhancing returns from trading activities; they can also transform the individual trader's knowledge and perceptions in ways that can be truly life-changing. This is not just a book of astro-trading theory, however. Tim Bost lays out step-by-step detailed descriptions of successful trades that have used these unique timing techniques to generate remarkably positive results. He also provides a historical perspective for the emerging market trends of today, with specific examples from trading records during the past century as well as an examination of precursor geopolitical dynamics going back nearly 700 years. But while the past can be used to validate and illuminate our understanding of the opportunities that we have today, Tim Bost's primary focus in this book is really on the future. He explains how the tools of astrological analysis can be applied to understanding market dynamics months before they actually occur. He also provides readers with a valuable resource - a detailed listing of key market activation dates in the future, based on precise studies of upcoming planetary interactions. And he doesn't stop there. Using the powers of the 90-degree dial developed by the Hamburg School, Bost provides snapshot forecasts for an astonishing variety of currencies, commodities, trading exchanges, precious metals, and major market indices from around the world. He even offers intriguing insights into some unexpected corners of global finance, including BitCoin, the Bilderberg Group, and the Islamic State golden dinar. While the opportunities that growing divergences offer us go far beyond ordinary expectations, this masterful work helps frame them with a uniquely useful approach. And to supplement Tim Bost's encyclopedic discussion, mundane astrologer Jim Cummins has contributed an Appendix to the book. In it he takes an in-depth look at some of the astrological concepts that can be applied to pin-pointing zones of geopolitical stress, examining, among other things, the influence on global economic affairs of the recent Chinese investments in developing key infrastructure on the African continent. It's the kind of big-picture thinking that can help long-term investors and short-term traders alike in identifying emerging trends that can create major opportunities for profit in the markets. In its entirety, Beyond The Shadows is a timely and compelling book. But it's also copiously illustrated with dozens of trading charts, horoscopes, maps, and diagrams that not only make its complexities more accessible, but also encourage the kind of creative thinking and broader vision needed to bring major opportunities into practical manifestation. If you're an active trader looking for an advantage in the markets, a long-term investor wanting to align yourself with emerging economic and geopolitical trends, or a dedicated student of the Law of Vibration and the effects of natural phenomena on market and economic cycles, then you shouldn't hesitate in getting a copy of this book. Beyond The Shadows will not only provide you with an immediate payoff - it will also become a reference book and trading resource that you'll find more and more valuable as time goes by. If you have any questions about this product by Bost Tim, contact us by completing and submitting the form below. If you are looking for a specif part number, please include it with your message.